personnel split into 133 teams. “I just always feel like we’re in a race to make sure we are generating capacity and capability, and that we are doing it faster than those who would attempt to do harm to us,” Rogers said. Rogers made the point that this is the only area in defense where staff and equipment are put to work straight away as opposed to the Navy, where a newly delivered aircraft may not be deployed for six months or so, or even longer if not needed. Rogers pointed out that some cyber teams operated in an offensive capacity and some defensive. Beyond that, the Admiral was not prepared to share any details, a stance that was handled with good humor throughout the luncheon by both the moderator, and by Michael Rogers. Light banter aside, the mission’s task is daunting in an age when cyber criminals almost have a concerning cult like status and more importantly when enemies and opposition forces are as adaptive as the computer equipment they operate. 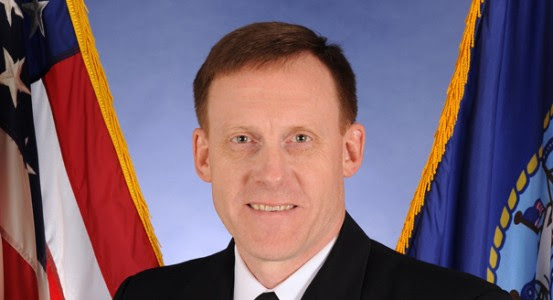 Admiral Rogers pointed out that the most significant thing about computers and this particular work is, at the end of every computer keyboard is just one person. So that one person has lot of power to make a difference, and in the case of cyber command and military defense, to make a difference for the good in the world. However, from an observational standpoint it is at that point it appears the United States military has one of its hardest tasks. Finding the right talent to hold that power. Rogers spoke of wanting to create a membrane, where computer talent could move in and out of both private sector and military roles. He stressed that without the “insight” talent gained by working in the private sector, it was hard to know fully what was going on in the world. Indeed, technology does move fast. Surprisingly, Rogers said he spent much time in Silicon Valley learning how Silicon Valley does things and also finding ways to attract and compete for talent. This is where, at a human level, it gets really interesting. Not only from the more superficial standpoint of the utilities and benefits provided on the large employment campuses like Google, which are known to spoil their employees rotten, but also from what I believe to be a far more, concerning standpoint. Mr. Rogers hit all the right tones and keys, one would expect of his esteemed position. He spoke passionately and supportively about the dedication of his staff, their talent, their willingness to serve, to fight the good fight for the good. He stressed the fact that the NSA operates within the current laws and if not, they stand up and take responsibility and own their mistakes. However, there was one point and one word that was missing from the entire fascinating speech and the one thing that I think would be the most critical and important thing when hiring and working with talent and that is “loyalty” and patrionism – things that cannot be bought. America is one of the grandest and most wonderful melting pots and it can be but applauded for that embracing of diversity. There are individuals and families from all over the world who have lived here for years and you would be hard put to find anyone who doesn’t, after having lived here for some time, have a keen sense of loyalty and patriotism for their adopted American homeland, as much as they love their own countries in spite of what their countries may or may not be facing. However, in these fast paced computer times, there is also a new breed of worker. Computer technicians who have been bought over in the past year or two from overseas to work in the private sector and corporate sector. These kids, usually under 32, are being paid six figures and upwards. Extraordinary salaries at young ages, in many cases. Yet these young women and men haven’t yet formed their own opinions of America as they have not yet lived in America. Nor are they actually having to work their way up in America, like many immigrants and foreign workers. They arrive to Silicon Valley with everything laid out for them, salaries, apartments, cars. Take for example one young man I met, from Asia, whose general attitude to the West was to go about his life, shortchanging everyone in order to, “stick it to the man,” in this case, the American man, or company, and in this case whatever DC company he was working for. In this case, make as much money as possible, rip off the West and then leave.